We have another cruise booked for later this year — yeah! This time, we will be hitting the sea on the MSC Poesia for seven days with Moni’s sister and the oldies. Having cruised in February with Moni’s sister, the rest of the family want to experience the joy of cruising. With the family being virgin cruisers, I decided to post this packing list for a cruise to help them (and you). I want to make sure that the folks rock up to the terminal relaxed and stress-free knowing that they haven’t overpacked and better still, not forgot the essential things. I have seen plenty of people waiting to embark with an ensemble of large suitcases struggling with them over to the baggage handlers, while others rock up with just one decent bag… in most cases you can tell who is new to cruising. I remember that we were once like that, with far too much stuff for a cruise. I wish back then I’d been better prepared. Now that the cruise deposits have been paid, the questions about ‘what to pack for the cruise’ and ‘what is it like on board the ship’ have started. 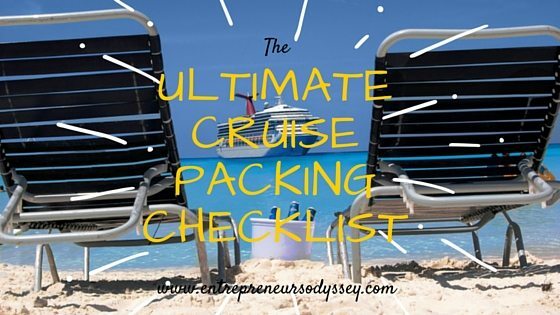 Hopefully, my Ultimate Cruise Packing Checklist will answer some of the classic cruise packing questions. Side note: having been roaming around the globe since March 2014, Moni & I don’t have a packing list anymore, as we are always living out of our bags. The positive thing about that is, each time we are going on a cruise or anywhere for that matter, we just pack up all our stuff and off we go knowing we have exactly what we need. With 11 cruises behind us and multiple flights since leaving Australia, it would be fair to say that we have exactly what we need, nothing more nothing less. This works for us right now, but may not be exactly what you need for your cruise or travel plans. So with that in mind, I have put together this comprehensive cruise packing list that will help any first time or even experienced traveller to pack and not forget anything. 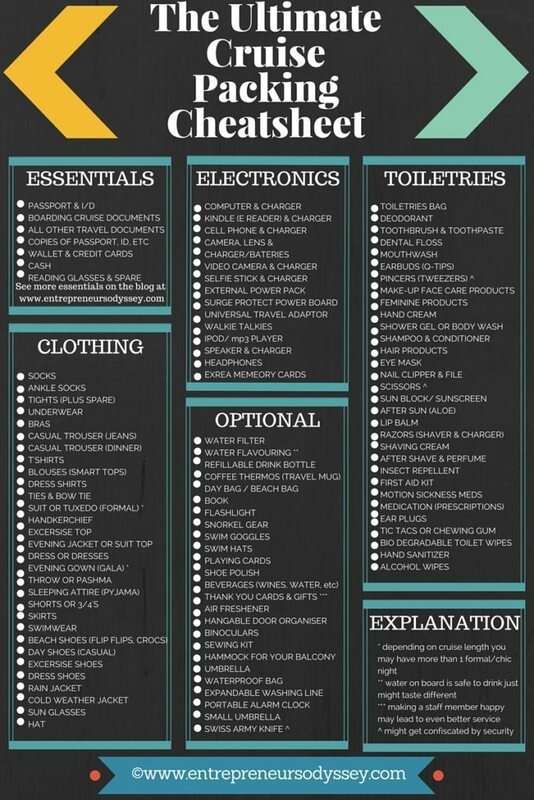 Below is a pin-able .jpg version of the “ultimate packing cheatsheet for a cruise”. Woe up there for just a minute before you press print, we would love for you to show us some love by pinning to one of your awesome Pinterest boards by using the button below. 12 Questions to ask before packing anything for your cruise? Before we get into the nitty-gritty of packing for your cruise, it is important to think about what you want to experience from your cruise. Let me help you out here. Asking yourself these questions (and probably a few more which I forgot) before you even consider getting out the suitcase will determine how successful you will be when you actually start to pack. The Ultimate Packing List for a cruise that I have compiled lists everything for a cruise, whether in summer or winter, whether you intend to go formal or not. As long as you can decide what your cruise day would be like, you will have a well-packed suitcase when boarding for your vacation. Even though I have listed hats, gloves, and scarves, it is obvious to me that you wouldn’t need them when cruising the Caribbean (well I hope not), so please consider this when checking off your packing list. Another very important point is weight. Even though cruise lines don’t limit you to any weight (very nice of them), just remember that you probably will have to fly to the cruise departure port and all flight carriers have weight restrictions. Any over the limit luggage will be very expensive. Something else you want to consider as well that is different from most other destination vacations. If you forget something, you can’t just run off to the local Myer, Carrefour, or Wallmart to buy another. Yes, cruise ships do have shops onboard and carry quite a range of products, but you will pay a premium for them and also certainly not have the choice you’re used to. Avoid forgetting things and use a reliable checklist. My packing list is not a gender specific cruise packing checklist (isn’t that a hot topic today), it covers all items no matter what. Just leave out of your luggage what doesn’t apply to you on the list, it’s that simple. Savvy packing tip: if traveling with a partner or family members, always pack some of each other’s items into each suitcase. It would not be fun if your husband has his clean change of clothes for dinner and you’re still waiting for your bag to turn up. Worse still, either of your bags gets lost and you have to fork out for a new set of items to tide you over. With a mixed suitcase, you’ll be both covered if one goes missing. A quick word on luggage. Luggage bags are thrown around without much regard for contents. Soft-sided luggage and hard-sided luggage seems to perform best especially when not over-stuffed. In the Ultimate cruise packing checklist, you’ll see that I have broken it up into sections. This is a screen shot of the pdf file that you can print out and check off as you pack. Let us take a closer look at what those sections entail. What are the essential cruise items that you must pack? These items are what I’d class as ‘must have’s’, not just for cruise travel but any travel. Flights, a weekend away, the lifelong dream destination trip to Africa or Europe. Consider a small over the shoulder travel pouch, or fanny pack for passport, credit cards, tickets, etc as these items should be kept on you at all times. Other travel documentation, such as airline tickets, rental car confirmation, hotel reservation, limo service etc, you book it take the paperwork with you. Many of these essentials should be kept on you at all times while travelling. Depending on what your preference is when travelling you might have a fanny bag, handbag, or just use your pockets. Moni & I both have 35-litre backpacks (carry-on) and a small shoulder bag/fanny-bag (personal item) each. Let’s move on to the next section. What clothes do you need when cruising? This is where you will probably have too many items. Here I suggest that you keep in mind the type of cruise, the length of cruise, the destination weather and what you intend to experience. With that in mind, you might not need cold weather clothes or many nice evening shirts, you might not need swimwear, you might not need formal evening attire, dress shoes etc. Pack, re-pack and then pack again is quite a good way to go about packing for your vacation. Bellow is a list of clothing items that covers pretty much everything. I hope you don’t pack everything, lol. Saying that, Moni & I have items for all weather occasions and we keep that at 20kg and a 35-litre backpack as carry-on. And we do that while living on the road as we do moving from place to place. Savvy packing tip: using packing cubes can help keep your suitcase tidy and reduce space. Always remember to fill every cavity, for example, push socks into your shoes or put your spare reading glasses in them. Be creative when packing. The next section is all about bathroom toiletries. This is where a lot of personal preferences can really expand your luggage. If you have your favourite shower gel or hair conditioners etc that you desperately need then take them. For those that are happy to use any brand then leave those things behind. Most cruise lines, like most hotels/motels, provide soap, shampoo, and conditioner. Also things like shower caps, Q-tips, and body lotion. Savvy packing tip: fill any liquids from your large bottles of cosmetics into small rubber bottles of less than 100ml, save space and they won’t break. Make sure that you try to limit yourself where ever you can, every gram is precious. Do you really need to take all those gadgets? Moving along, next, we have the electronics section. Those gadget lovers amongst us will really have to restrain themselves here. Savvy packing tip: most cruise cabins have limited power points so a surge protecting power board is handy. Please not though that some cruise lines have been known to confiscate them. If you can go without your laptop for the vacation then leave it behind. Internet costs can run well into the hundreds of dollars on cruise ship’s and the connection is average at the best of times. You will notice that most items need chargers if you can always try and have items that use the same charge adaptor that way you can limit the amount you’ll need to pack. Next up is what I call miscellaneous extras. You might choose to put some of them into the essentials section, that’s fine, just try to limit the amount you really need. Moni & I have a few of these items with us and probably would take a couple more if only having a trip once a year say, but being location independent and moving around every three or four months limits what we can keep with us. What should you pack when cruising with children? If you are not going to be travelling with children then you can skip this section. You know that you could probably fill a case alone just with stuff for your kids, but believe me, there is so much for kids to do on most cruise ships these days that you probably won’t need a thing. Check with your cruise line as to what children’s facilities and services they offer. They really do tend to promote very kid friendly cruises these days, with many cruise lines having the kids cruise for free with two paying adults. * These items could be confiscated by security when boarding, be sure to place them in your main luggage for the hold, especially on aeroplanes. ** Always fill smaller containers with these to take up less space and weight. ^ If flying to join your cruise make sure to pack only non-aerosol items. Be sure to give us your feedback in the comments below or any more tips that would make this even better for fellow cruisers to benefit from, we are always trying to find ways to improve our packing skills. That’s it, folks, my Ultimate Cruise Packing Checklist explained and discussed. Hopefully, you will be able to pack with more ease and less stress the next time you cruise or travel anywhere with luggage. 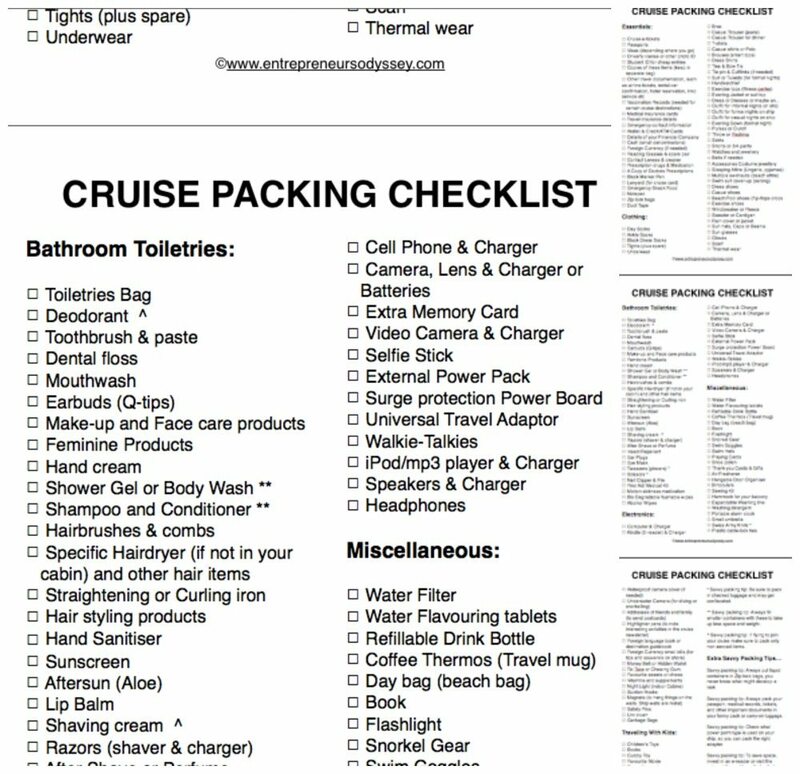 If you missed the link in the post to download and print out the ultimate cruise packing checklist then just click that gold coloured link above and go print it. Tags: 12 Questions to ask before packing anything for your cruise?, Bathroom toiletries for a cruise holiday, Bathroom toiletries for a cruise vacation, Clothing for a cruise holiday, Clothing for a cruise vacation, Electronic gadgets for a cruise holiday, Electronic gadgets for a cruise vacation, Essentials for a cruise holiday, Essentials for a cruise vacation, Miscellaneous items for a cruise holiday, Miscellaneous items for a cruise vacation, Pack re-pack and then pack again, Savvy packing tips, Say goodbye to overweight luggage and splitting sides, The Ultimate Cruise Packing Checklist, What clothes do you need when cruising?, What should you pack when cruising with children?